Lauren’s Wing is so thankful we had the funds to help Max with his orthopedic surgery and recovery. We thank everyone who supports our mission to provide life saving care. March 30, 2016 – Max Update! I am back to share my good news. My name is Max and I am the latest Lauren’s Wing recipient. I am 6 years old and 75 pounds of maximum energy and curiosity! Unfortunately, that curiosity got the best of me one day and I decided to go exploring all on my own. 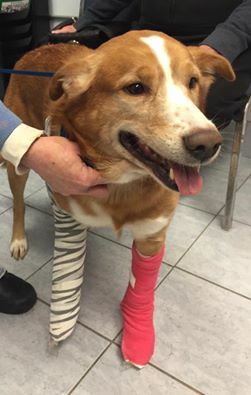 While making a run across the road, a car hit me breaking both of my front legs and injuring my paw. Unfortunately, my owners were unable to provide the medical care I needed, but they lovingly surrendered me to Action for Animals so I could have a chance at survival. The veterinarians at AFA examined my injuries and made temporary splints for my legs. Arrangements were made for a trip to Ohio State University so I could undergo orthopedic surgery. A pin and plate were placed in my right leg. My broken left leg with the injured paw was wrapped in a splint in hopes it will mend with proper rest. I am now back at Action for Animals and am doing the best I can with the “resting” part, but it sure isn’t easy for a fellow like me with so much love and enthusiasm to share. In spite of all the trauma I have been through the last month, I still enthusiastically greet everyone with my tail wagging and a kiss. I am counting the days till my special collar comes off. If you notice the duct tape, it is not for decoration. I love trying to get my collar off, but the loving staff at AFA keeps fixing it and reminding me stay calm and be patient. 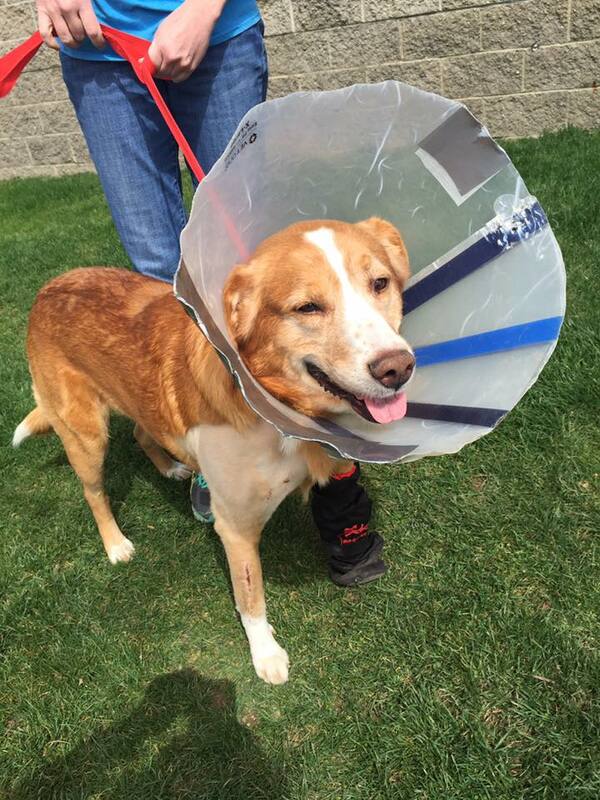 My prognosis is good, so when I finish my healing, I would love to meet some new friends and find a forever home!